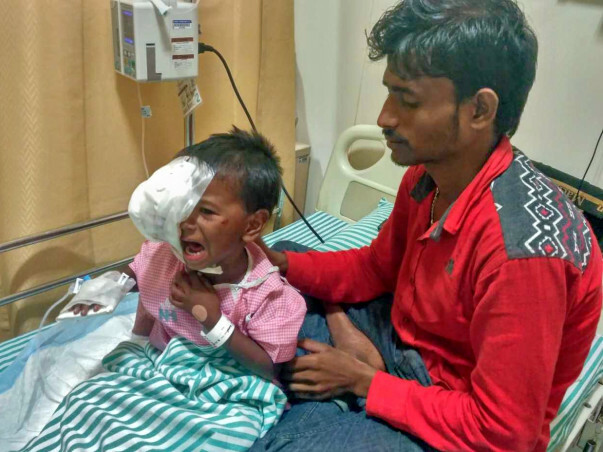 A few months back 4-year-old girl Puthul Kumari Paswan was diagnosed with a severe eye cancer called Neuroblastoma. Neuroblastoma is a type of cancer that occurs in the nerve tissues and causes severe pain in the tissues and nerves. Puthul is suffering and has severe pain in her eye. She has been advised to undergo chemotherapy followed by a bone-marrow transplant in order to treat her condition. 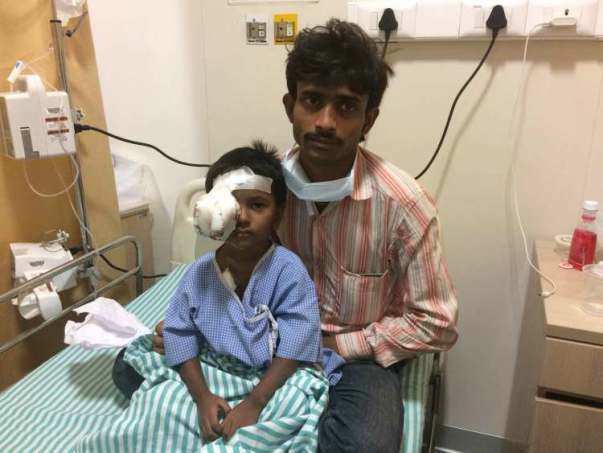 Puthul's cancer has damaged her right eye. If untreated it will take her second eye as well as her life. 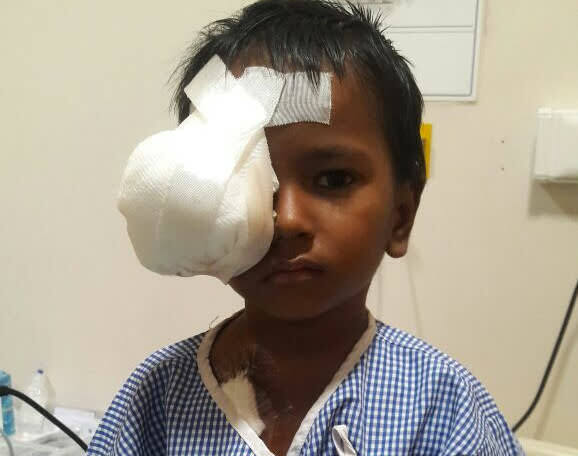 Now, what is left of Puthul's swollen eye often bleeds. She has a heavy bandage on her eye which needs to be changed once in two days. Sometimes, it needs to be changed more frequently if there is excessive bleeding. But the worst of it is that her second eye seems to be getting affected too. Puthul needs this treatment at the earliest before her condition becomes even more critical. 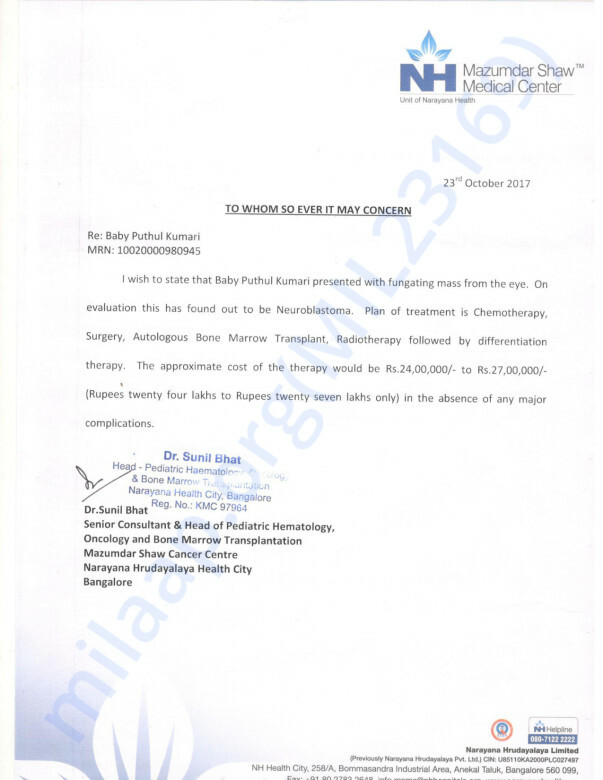 The treatment costs around 24 -27 lakh Rs. 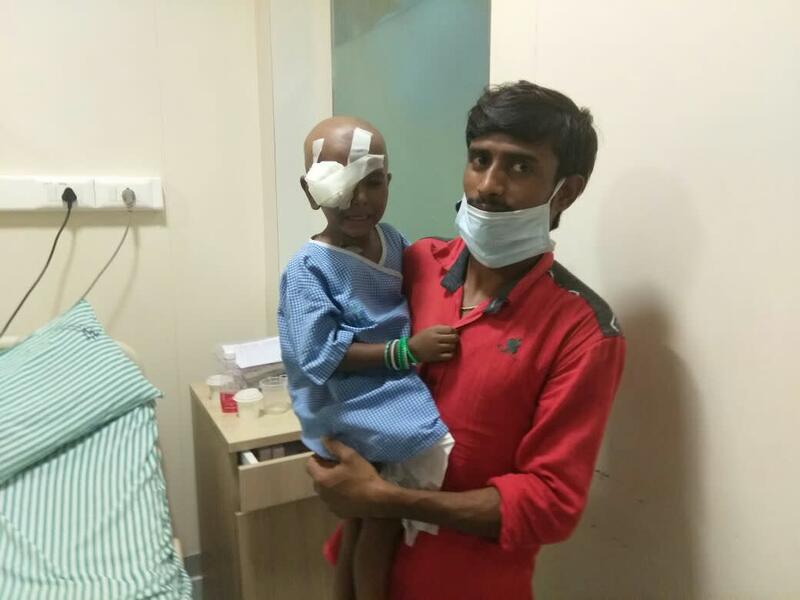 Unfortunately, Puthul's father, Shivanath Paswan, only earns a salary of 5000 Rs a month and cannot afford the cost of treatment. He is extremely worried that without the funds his daughter will not get better. Your contribution can help save Puthul and give her the treatment she deserves. Thank you for the wonderful support that you have shown towards Puthul so far. I have some unfortunate news to share with all of you today, Puthul passed away yesterday (25th March)/ She developed infections and was being administered treatment. However, her body started showing resistance and her health started deteriorating from Friday. Unfortunately, her little body could not take the stress. Her family comes from an economically poor background. A sum of ₹30,000 is being transferred from the funds raised to help her family to perform the final rites for Puthul. The funds raised so far have been used towards her medical expenses and treatment, the remaining funds will be used to clear her pending medical bills. Thank you for the wonderful support once again. Do pray for her soul to rest in peace. Her family needs your support and prayers the most in this difficult time. Thank you for the wonderful support that you have shown towards my daughter. She is doing better now compared to earlier and has no loss in vision. We are still staying in Bangalore so we can visit the hospital on a regular basis for her follow-ups. I would like to thank all the donors for the overwhelming love and support that you have shown towards my daughter. Please do pray for her health and speedy recovery. Will keep you posted. Puthul is recovering and is doing good. Here is her recent picture with her father. Puthul's father wants to tell Thank you to all donors who supported the campaign and saved his daughter. May the God bless you all. My prayers for a speedy recovery. God bless you child. My little bit ..may Allah heal her.